Mountain Village is comprised of and surrounded by a diversity of wildlife habitats including mixed conifer, spruce-fir, and aspen forests, meadows and grassland, talus and scree, and wetland and riparian zones. These habitats are occupied by a variety of wildlife species on both a seasonal and year-round basis, and they support rich and biodiverse resources including 314 known vertebrate species of terrestrial and aquatic wildlife, and several species classified as sensitive, threatened or endangered by the United States Fish and Wildlife Service. Black bears are a medium-sized bear and Colorado’s largest carnivore. The color of their fur varies greatly, from black to pale brown or sometimes even blond. Some adult black bears closely resemble grizzly or brown bears, although presently there are no known populations of brown bears in the state. As omnivores, a black bear’s diet largely depends on what seasonable food is available, although vegetables are their mainstay. When available, black bears eat a diversity of insects, including beetle larvae, ants, wasps, bees, termites, etc., and they kill and eat a variety of small mammals including rodents, rabbits and young or unwary ungulates. An ample food supply is critical to a black bear’s survival in the spring, when they emerge from dormancy, and in the late summer or fall when they are putting on fat for winter. As for hibernation, black bears hibernate for up to 200 days during the winter months in rock cavities or under shrubs and trees, and cubs are born in the den in late January or February while the mother is in hibernation; litter size is usually two or three. Most black bear encounters happen in the early morning or evening hours between the months of March and November when bears are actively searching for food. To live and play in bear country it’s a must to be aware of a bear’s nature and habits. Most conflicts between bears and people are linked to careless handling of food and garbage. In Mountain Village, it is required that all trash containers and enclosures are wildlife-resistant and kept locked at all times when placed outside for collection. Bag your trash tightly to contain odors and place bags inside your garage or storage area until day of pickup. Do not put your trash and recycle containers out the night before (or days before pickup). Pick up any loose or spilled garbage. Ensure that your trash containers are locked and wildlife-resistant. If you do not have a wildlife-resistant container contact your trash service provider immediately for replacement. Always keep your trash bins clean (hot water and a bleach solution). Fruit, melon rinds or other food items in compost piles may attract black bears, so don’t add these and other pungent scraps to the pile. Adding lime will help promote decomposition and reduce odor. Keep your BBQ grill free of food and grease to the extent possible. Lock your car, home windows and doors. Never leave human, livestock or pet food, including bird feeders, outside or in a vehicle. For information on what to do if you encounter a bear, we encourage you to check out the Division of Wildlife’s website and read these brochures: Living with Bears and Bearproofing Your Home. long sharp claws that assist in tree climbing. Leaves, buds and young shoots of grasses and forbs during the warmer months and inner bark of trees in winter months are the mainstay of a porcupine’s diet. Active all year long, porcupines typically seek refuge under rocks, in hollows or in the crotch of a tree during the daytime. A number of our homeowners have noticed porcupine damage on their young, landscape trees – bark stripped from trees and girdling of the main stem. It’s also been noted that porcupines have done quite a bit of property damage to home structures. Although this is a private property matter, we will follow-up with any site visit requests from homeowners to survey the potential porcupine damage. It will be up to the individual homeowner as to how they want to resolve their porcupine problem. It is important to note that as long as there is a desirable food source – young, juicy conifers – porcupines will feast. This particular animal tends to feed on the tops of mature trees due to their tender growth. This does not kill the tree, but it causes lateral branching where the terminal branches are removed. Trees most susceptible to mortality are young saplings where porcupine feeding results in basal girdling. This leaves the tree open to infection and/or susceptible to burrowing insects attracted to the wound. Porcupines are also fond of succulent plants such as roses, pansies, all types of berries and other garden favorites. Further, they can cause damage to homes and other structures – they seem to like the laminate glue that is used in plywood and particle board and other salt-treated wood objects like door frames. In addition, porcupines are nocturnal feeders, therefore they are seldom seen. This leads people to believe the damage is caused by other critters. To protect your mature trees, place a 30-inch wide band of aluminum flashing around the tree trunk to prevent bark chewing at ground level. For small trees, a wire basket or fencing may be used to keep them off of trees. Repellents, such as thiram, can be sprayed to discourage porcupine chewing, but the chemical will have to be reapplied frequently. 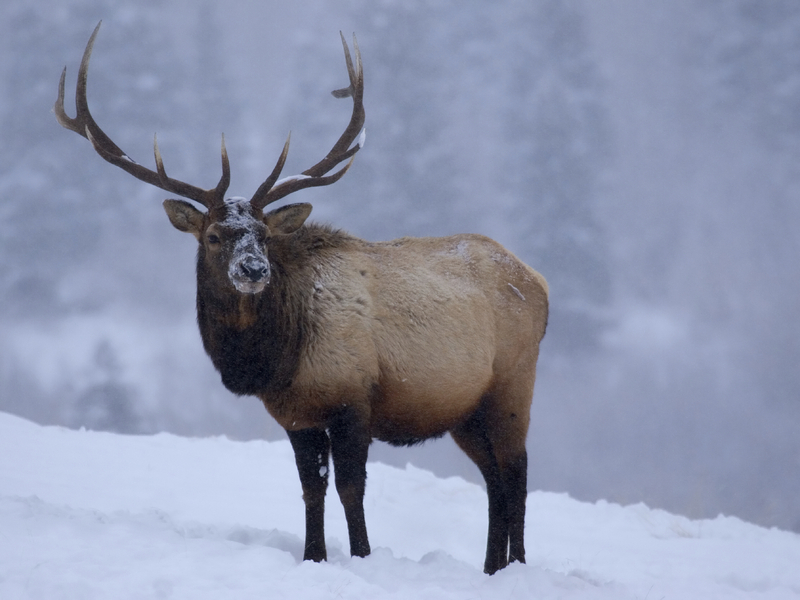 Since we’ve only highlighted a couple of our wildlife neighbors on our site, we encourage you learn more by visiting the Colorado Parks and Wildlife website.